I bought this guy from a friend. Had no idea CP-70s existed until I saw it, and it's perfectly weird and great for me. He said the output was not working, but that it did work right before it was moved from his grandfather's house to his. So I think, "hmm, probably just a jack solder knocked loose in moving or like such as." The output jacks are working, but the signal is very very low and noise is super high, on both XLR and 1/4". I did a visual check of everything and poked around in the pre and power amp with a chopstick with the piano on, trying to find a loose connection, but everything seems good. Capacitors seem to all have been replaced with modern ones, which is great. But it's hard to tell the iPhone gain vs. CP-70 pickups gain, maybe not a fair test of 2nd half of circuit? ...in the preamp and I've found some quiet places on the board, but nothing that sounds super broken or one component that's really losing the signal. So I'm at a loss of what to do next! I know this is almost more of an amp/board question, but any suggestions are appreciated! 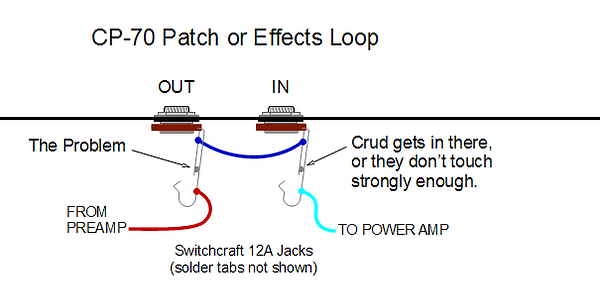 The problem is quite likely the 1/4" jack connectors that make up the effects loop. All it takes is a little corrosion, and the signal doesn't get from the "shunt" connection on one jack to the other. Sometimes you can clean the little round connection button on the prong, and sometimes you need to get them to more forcefully touch each other. Once you have used your alligator clips to prove that this is the problem, the best plan is to simply replace the jacks. Markertek sells Switchcraft 12A for $1.85 each. If you want the longer threads (for thicker mounting panels), get the L12A. I have no idea why Markertek doesn't stock the L12A, but Mouser has them for $2.70 each. I did try tracing the jacks and it seems like the signal was okay coming through them. I'll take another look and be sure to clean them though. Anything else I should look at, maybe in the power amp, assuming that's after the FX IN? Also what are you using to make your diagrams? Thanks for the clear explanation. I do my diagrams in LibreOffice Draw. I had previously created the 1/4" jack diagram for a previous project, so I thought it wouldn't take long to create the diagram above. The fully-enclosed plastic jacks are not my cup of tea, but they are easier to include on a PC-board design. Switchcraft makes this type too. Are there any manufacturer's markings on your jacks? The fully-enclosed plastic jacks are impossible to inspect and repair, and it is hard to unsolder and remove them from the board without mutilating them. Have you tried plugging in a guitar cable into both of the jacks to simply jumper them? That would be easier than getting an alligator clip lead to go from tip to tip. I did try jumpering between the OUT and IN, and it didn't make a difference. There aren't any markings on the jacks, and they are super robustly attached to the board and the front panel (see photo below). So they may be a bear to get out and test. This CP-70 seems like a newer revision than many of the photos of others I've seen, the pickups all run to boards before coming into the preamp, very beautifully done. Yeah, you have to murder those jacks to get them removed from the board. Hmmm... did you try using alligator clips to jumper the tip connection on one jack to the tip connection on the other jack? I see the Pout (Patch out) silk screened on the board. Is there another terminal marked Patch In or Pin? I believe it is just from that white wire to that red wire, but you should look underneath the board to confirm. Have you found a circuit schematic that seems to match your CP-70? I'll have to try the alligator clips again. I didn't see any big loss of signal around those, but I'm not 100% sure I tried all the pins. Thanks for the suggestions, I'll look at the board again to see if there's a Patch In or Pin! The schematic I've been using is this one: http://www.synthfool.com/docs/Yamaha/Yamaha%20CP-70B%20Operating%20Manual.pdf I've never really read a complex schematic like this before, so it's hard to be certain— the broad strokes seem to line up, but I haven't gone through each little component. I believe it's right though?